Designing and installing all the necessary components of an indoor sports facility is a difficult process. 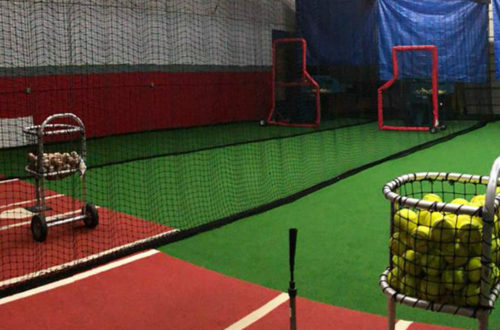 Our mission at On Deck Sports is to provide the equipment and support to make that process as stress-free as possible. A major part of nearly all indoor facilities is the installation of new artificial turf rolls that will provide a safe, durable surface for your athletes. Making sure your facility is ready for the delivery of these turf rolls is imperative to ensure a smooth process. Your new turf will arrive via a freight carrier due to the size and weight of the rolls. They come in 12 or 15-foot rolls, depending on which turf product and size you order. We currently use three freight carriers for our turf deliveries. When one of these freight carriers receive the turf, they will call to set up a delivery time for each facility. The schedule is set for your convenience, but if the delivery is not made within a reasonable time frame, storage fees may be applied at a cost to you. On the scheduled day of delivery, you will receive a call from the delivery driver to notify you of the delivery. It is suggested to have the turf delivered to a location with a loading dock to make the unloading of the turf easier. If there is no loading dock available, the area could be considered “limited access” and raise the cost of the shipping. When the delivery arrives to your facility, you are responsible for the off-loading of the turf rolls. To accomplish this, extra equipment such as a fork lift with a carpet pole extension or a carpet dolly may be required to be rented. You may also need extra assistance to help move the rolls, which can range from around 138 pounds to approximately 1,000 pounds depending on roll size and turf type. If you need to adjust the shipping address of your delivery, make sure to do so before the delivery has shipped from the warehouse. There is an option to change the address following the shipment from the warehouse, but it is considered a reconsignment and would add a fee to your shipping cost. Any additional hardware that you purchased with your turf (seaming fabric, turf spikes, etc.) will generally be shipped with your turf and rolled inside before shipping. This is noted on the outside of the shipped roll with a sticker labeled “Hardware Inside”. There are cases in which this hardware will ship separately. If you ordered turf glue, it will ship separately. Smaller quantities of glue will ship via FedEx while orders of seven or more buckets of glue will be placed on a pallet and shipped via one of our freight carriers. After receiving your new rolls of turf, we strongly suggest you inspect each roll thoroughly for damage before signing for the shipment. In the case of damage, sign the bill of landing (BOL) as damaged with the freight carrier and immediately contact On Deck Sports to report the damage. Following these steps will ensure a smooth process for receiving your new turf. Once completed you are nearly ready to lay down the turf and start realizing your dream of opening, or upgrading your facility.